Work with Apple iOS, Android 2.x/3.x/4.x, Windows Phone 7.x, Windows 8 and Blackberry 10. Support IBM Notes® and IBM Verse® mobile users through on-premises IBM Domino® and IBM Domino Express deployments, and in the IBM cloud with IBM SmartCloud® Notes or IBM Verse. Allow users to read and compose IBM Domino encrypted email and search corporate directories to find individuals and/or groups by name. Remotely wipe for lost or stolen devices—select full wipe of a device or partial wipe of only IBM Notes Traveler data. Use security policies to control password length and strength with an option to deny access to unencrypted devices and an option to prohibit camera usage. IBM Notes Traveler synchronizes data in transit over a security-rich Hypertext Transfer Protocol/Secure Sockets Layer (HTTP/SSL) connection and encrypts data at rest (on device) on Apple iOS, Android and Nokia Symbian devices. Monitor the IBM Notes Traveler community by user name, device type and operating system version; allow or deny access based on company security policies; and provide automated client updates from a single point of control. Scheduled synchronization and data filtering policies help you optimize network throughput and deliver support for Linux, Microsoft Windows and IBM i servers. Download IBM Verse from the iTunes app store to identify and see mail from important contacts, manage follow ups and use calendar. 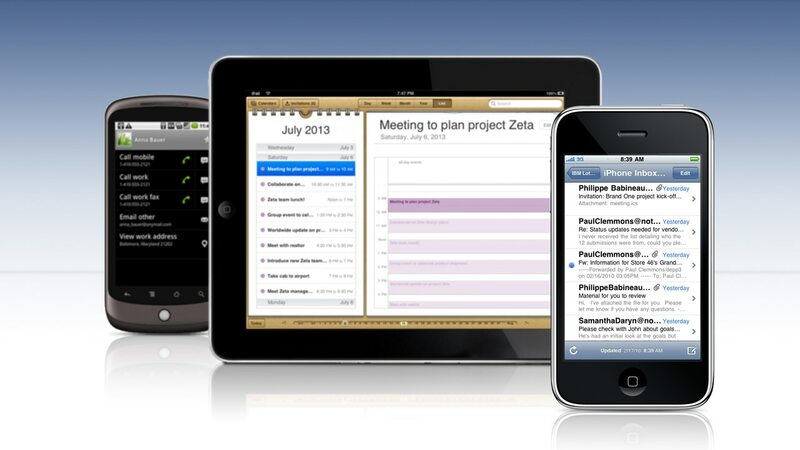 Continue to use IBM Notes Traveler with Apple provided mail, calendar and contacts apps on your iOS device. Mark IBM Verse contacts favorites and sync Verse contacts when IBM Traveler is connected to an IBM Verse cloud. Version 9.0.1.4 includes a new Actions application that displays action Items on Android clients and supports Redhat Enterprise Linux Server 7. Version 9.0.1.3 adds support for using Google Cloud Messaging (GCM) for push notifications, which can greatly improve the battery life of Android devices. Expand IBM Domino Server support with the ability to install IBM Notes Traveler on IBM Domino 8.5.3 with Upgrade Pack 1 installed (excluding IBM Traveler for iSeries), IBM Domino 9.0 and IBM Domino 9.0.1. Use Android client for IBM Notes Traveler from Google Play. Set your office status from iOS or Android. Enforce a Prevent Copy of messages by policy for iOS and Android devices. Add meeting room information to calendar entries on iOS. Attachments and inline images are supported on Windows Phone/RT platforms. Other Android enhancements include widget customization, calendar conflicts, navigation in To Dos to specific By Due Date entry and option to always bcc yourself when composing email. Enable your Bring Your Own Device (BYOD) program with support for a range of mobile devices and operating systems. Take advantage of To Do sync for Android and Apple iOS and updated device support for Windows Phone, Windows Tablets and Blackberry 10 devices. IBM Notes Traveler 9.0 supports additional operating system platforms, including IBM i, Windows Server 2012, Redhat 6 64-bit mode and SUSE 11 64-bit mode.